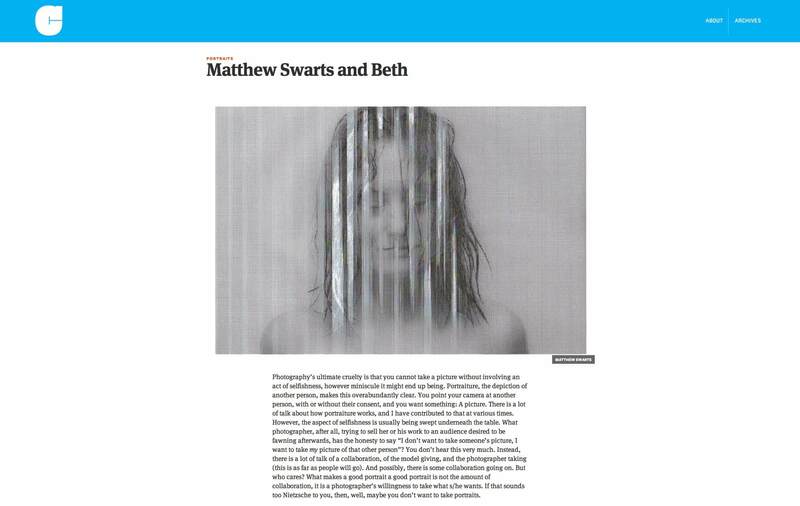 “Here is Beth, photographed by her partner, Matthew Swarts. Of Beth we, meaning everybody except those who know this young woman in person, have a set of photographs and nothing else. What are we going to make of Beth now? What do these photographs tell us about her? What do they tell us about the photographer? What do they tell us about their relationship? I don’t think there is a simple answer for any of these questions. This is exactly why the photographs are so compelling. In other words, Swarts’ selfishness has paid off. As a matter of fact, the picture at the very top obviously does not look like a straight photograph, and it isn’t. It’s a scan of a photograph emerging from a broken printer. Machines, of course, cannot be selfish (machines are always only stupid). But people using photographs coming out of broken machines can be. And Beth, the project, shows how this all comes together, albeit in ways that have the process remain a mystery. That’s the other frustrating thing about portraiture: You will never learn it from other people, only from doing it yourself – however much was, is and will be written about it. These pictures show the same woman in a variety of ways that almost make it seem we’re looking at more than one person. Almost. It is that “almost” that is crucial here, because in that “almost” lies the fact that while photography cannot literally depict someone’s inner state, it can still make a stab at it. Or rather: A photographer can make a stab at showing us her or (in this case) his idea of that other person’s inner state, which he has no direct access to, either (this is what makes life exciting – life on Vulcan must be perfectly boring). Our sincerest and most kind thanks to Jörg Colberg for this generous feature!